A high percentage of individuals with eating disorders (ED) achieve incomplete recovery following treatment.1 In an attempt to increase the efficacy of ED treatments, the identification of predictors of outcome, adoption of individually tailored interventions based on new treatment targets, and facilitation of access of ED patients to evidence-based treatments2 should be addressed as a matter of urgency. Cognitive behavioral therapy (CBT), antidepressants, and interpersonal therapy (IPT) have been suggested as evidence-based treatments in bulimia nervosa (BN) and binge eating disorder (BED).3 Limited benefits have been reported in the pharmacotherapy of anorexia nervosa (AN), and no single psychological intervention has demonstrated a clear superiority in adults with AN, both in terms of effectiveness and adherence to treatment.4 However, recently emerging data on the effectiveness of family therapy in adolescents with AN have been reported.4 Although effective, and displaying better results than in AN, treatments for BN are characterized by optimal responses in no more than 50% of cases.1 Among psychological factors proposed as predictors of outcome in the ED, alexithymia has elicited a growing interest. Coined by Sifneos,5 the term alexithymia was initially introduced to describe a cognitive style and affective characteristic of psychosomatic patients, consisting in difficulty in identifying and communicating emotions and in discriminating them from bodily sensations, with a limited fantasy and a concrete, externally oriented cognitive style. Subsequently, the construct evolved, expanding beyond the area of psychosomatic diseases, and has been implicated in a series of physical and mental disorders, including ED.6 Development of the self-administered Toronto Alexithymia Scale (TAS),7 and, in particular, of its 20-item form (TAS-20),8 has contributed largely to the dissemination of studies on alexithymia, providing a reliable and valid measure of the construct, although a multimeasure multimethod has been suggested in order to improve the quality of research.6 In general, high levels of alexithymia have been found in subjects with ED, with specific deficits in identifying and communicating emotions.9 While many studies have reported no significant differences according to diagnostic subgroups of ED, other studies have shown higher levels of alexithymia in AN, particularly with regard to the difficulty in communicating emotions.9 Levels of alexithymia are generally reported to improve following treatment of ED, although the clinical relevance of this change is questionable, taking into account that, in the majority of cases, alexithymia levels remain elevated even after treatment.9 Whether alexithymia should be considered a state-dependent variable or a trait remains open to debate. Research findings tend to support the hypothesis whereby alexithymia cannot simply be considered as depending on ED symptoms alone, as the role of anxiety and depression on alexithymia remains controversial, and the presence of conflicting data underline the need for further investigations using a more appropriate methodology.9 Moreover, the characterization of alexithymia as a stable personality trait or state-dependent phenomenon is often discussed in terms of absolute and relative stability; ie, levels of alexithymia may vary to reflect a change in symptom severity (lack of absolute stability), while the relative differences of scores between patients remain the same (relative stability of the construct).6 Prevalent evidence supporting the relative stability of the construct has led researchers to investigate the possible predictive power of alexithymia on treatment outcome. Based on these premises, the aim of this paper was to summarize and discuss data present in literature regarding: 1) the implications of alexithymia as a predictor of outcome in ED treatment, and as a variable influencing choice of treatments; and 2) the effect of treatments on alexithymia levels in ED patients. This paper provides a systematic review of the literature on the implications of alexithymia on treatment, and the effect of treatments on alexithymia levels, in individuals with ED (AN, BN, BED, and/or ED not otherwise specified [EDNOS]). A literature search with no time limits was carried out in July 2014 on PubMed, PsycINFO, and Scopus databases. Only papers written in English were considered for the purposes of this review. The search was conducted using the keywords alexithymia, anorexia nervosa, bulimia nervosa, eating disorders, and treatment. The initial search resulted in the identification of 828 abstracts, which fell to 357 after the elimination of duplicates. Abstracts were then reviewed and studies selected on the basis of the following criteria: 1) measurement of alexithymia using standardized instruments, namely one of the three versions of the TAS; 2) reporting of data on the effects of specific treatments on alexithymia in individuals with ED; 3) reporting of data on the impact of alexithymia on treatment outcomes in individuals with ED; and 4) reporting of data on the impact of alexithymia on choice of treatment in individuals with ED. Twenty-seven articles were identified. Following further examination of the full text, 15 papers were finally selected and considered for the present review. Twelve articles did not meet the inclusion criteria as described. The 15 selected studies are summarized in Tables 1 and 2. Ten studies focused on the implications of alexithymia as a predictor of treatment outcome in subjects affected by ED, one study analyzed the implications of alexithymia on treatment choices for individuals with ED, and ten studies investigated the effects of specific treatments on levels of alexithymia in individuals with ED. Abbreviations: 16PF, 16 Personality Factors; AN-B/P, anorexia nervosa – bingeing/purging type; AN-R, anorexia nervosa – restricting type; BDI, Beck Depression Inventory; BED, binge eating disorder; BITE, Bulimic Investigatory Test Edinburgh; BN, bulimia nervosa; BSQ, Body Shape Questionnaire; CBT, cognitive behavioral therapy; CGCBT, combined group CBT; CGI-C, Clinical Global Impression Change; CGI-S, Clinical Global Impression of Disease Severity; DASS, Depression, Anxiety, and Stress Scale; DDF, Toronto Alexithymia Scale Difficulties Describing Feelings factor; DIF, Toronto Alexithymia Scale Difficulties Identifying Feelings factor; DSM-III-R, Diagnostic Statistical Manual of Mental Disorders, 3rd Edition Revised; DSM-IV, Diagnostic Statistical Manual of Mental Disorders, 4th Edition; EAT, Eating Attitudes Test; ED, eating disorders; EDE, Eating Disorder Examination; EDE-Q, Eating Disorder Examination Questionnaire; EDI, Eating Disorder Inventory; EDI-SC, Eating Disorder Inventory-Symptom Checklist; EDNOS, Eating Disorder Not Otherwise Specified; EOT, Toronto Alexithymia Scale Externally Orienting Thinking factor; EV-A, Euthymic Activities, General; EV-H, Euthymic Activities, Frequency; F, female; G-CBT, Group-CBT; GAF, Global Assessment of Functioning; HADS, Hospital Anxiety and Depression Scale; HAM-D, Hamilton Depression; HC, healthy control; IPT, interpersonal therapy; JTCI, Junior Temperament and Character Inventory; M, male; MINI, Mini-International Neuropsychiatric Interview; MMPI-2 NTIS, Minnesota Multiphasic Personality Inventory-2 Negative Treatment Indicators Scale; MR-SOC, Marburg SOC Scale; MUM, Marburg Diagnostic Inventory; PET, psychoeducational therapy; RSAS, Revised Social Anhedonia Scale; RSES, Rosemberg Self-Esteem Scale; SA, social anhedonia; SCID-I, Structured Clinical Interview for DSM-IV-Text Revision (DSM-IV-TR) Axis I Disorders; SCL-90-R, Symptom Checklist-90-Revised; SIAS, Social Interaction Anxiety Scale; SPS, Social Phobia Scale; TAS Total, Toronto Alexithymia Scale Total Score; TAS-20, Toronto Alexithymia Scale 20-item Version; TAS-26, Toronto Alexithymia Scale 26-item Version; YSR, Youth Self Report; ICD-10, International Classification of Diseases, tenth revision. Abbreviations: 16PF, 16 Personality Factors; AN-B/P, anorexia nervosa – bingeing/purging type; AN-R, anorexia nervosa – restricting type; BDI, Beck Depression Inventory; BED, binge eating disorder; BITE, Bulimic Investigatory Test Edinburgh; BN, bulimia nervosa; BSQ, Body Shape Questionnaire; CBT, cognitive behavioral therapy; CGCBT, combined group CBT; CGI-C, Clinical Global Impression Change; CGI-S, Clinical Global Impression of Disease Severity; DASS, Depression, Anxiety, and Stress Scale; DDF, Toronto Alexithymia Scale Difficulties Describing Feelings factor; DES, Dissociative Experiences Scale; DIF, Toronto Alexithymia Scale Difficulties Identifying Feelings factor; DSM-III-R, Diagnostic Statistical Manual of Mental Disorders, 3rd Edition Revised; DSM-IV, Diagnostic Statistical Manual of Mental Disorders, 4th Edition; EAT, Eating Attitudes Test; ED, eating disorders; EDE, Eating Disorder Examination; EDE-Q, Eating Disorder Examination Questionnaire; EDI, Eating Disorder Inventory; EDI-SC, Eating Disorder Inventory-Symptom Checklist; EDNOS, Eating Disorder Not Otherwise Specified; EOT, Toronto Alexithymia Scale Externally Orienting Thinking factor; EV-A, Euthymic Activities, General; EV-H, Euthymic Activities, Frequency; F, female; GAF, Global Assessment of Functioning; HADS, Hospital Anxiety and Depression Scale; HAM-D, Hamilton Depression; HC, healthy control; IPT, interpersonal therapy; JTCI, Junior Temperament and Character Inventory; M, male; MR-SOC, Marburg SOC Scale; MUM, Marburg Diagnostic Inventory; PET, psychoeducational therapy; RSES, Rosemberg Self-Esteem Scale; SCID-II, Structured Clinical Interview for DSM - II; SIAS, Social Interaction Anxiety Scale; SPS, Social Phobia Scale; TAS Total, Toronto Alexithymia Scale Total Score; TAS-20, Toronto Alexithymia Scale 20-item Version; TAS-26, Toronto Alexithymia Scale 26-item Version; YSR, Youth Self Report; EDI-2, Eating Disorder Inventory -2; ICD-10, International Classification of Diseases, tenth revision. The study by Schmidt et al10 was the first to analyze alexithymia as a predictor of outcome of short-term treatment of BN adopting a prospective design;. The study recruited 41 female patients affected by BN according to Diagnostic and Statistical Manual of Mental Disorders, 3rd Edition Revised (DSM-III-R) who were submitted to a 10-week treatment program; the treatment plan included both psychotherapy and drug treatment (fluvoxamine). TAS-26 total score at baseline was not related to any outcome variable considered; however, TAS total score at 10 weeks was positively correlated to the number of binges. Given that the majority of patients were not recovered at the end of treatment, the authors hypothesized that persistence of eating symptoms could be related to persistence of high levels of alexithymia. Two years later, de Groot et al11 evaluated alexithymia in a sample of 31 women with severe BN according to DSM-III-R. All patients were admitted to the Toronto Hospital Day Hospital Program for ED, which included an intensive 9.6-week group psychotherapy. After treatment, patients were divided into two groups defined as abstinent (no binge/purge episodes) or symptomatic (>1 binge/purge episode), based on the frequency of relevant symptoms during the 28-day period prior to discharge. Following treatment, differences in emotional awareness between abstinent and symptomatic groups were found to be clinically relevant; indeed, nonalexithymic subjects were detected predominantly in the abstinent group, while alexithymics were mostly found among symptomatic patients. At discharge, abstinence from binge eating and vomiting episodes in the last 4 weeks was associated with a significant reduction of TAS-26 total scores; moreover, a positive correlation was observed between TAS scores, level of depression, and frequency of episodes of vomiting. At the end of treatment, therefore, patients with higher alexithymic scores were more symptomatic in terms of ED and depression symptoms. Becker-Stoll and Gerlinghoff13 evaluated 47 female patients with ED (18 with AN, 25 with BN, and four with EDNOS according to the DSM Fourth Edition[DSM-IV]) as part of a 4-month outpatient group treatment program at the Treatment Center for Eating Disorders of the Max Planck Institute of Psychiatry in Munich. The center offered a three-phase treatment program: an outpatient motivation phase (4 weeks), a day hospital treatment phase (4 months), and a 4-month follow-up phase. Treatment methods included CBT, psychoeducational therapy (PET), and IPT. Patients were divided into two groups (patients affected by anorexia and bulimia). The study revealed no correlation between TAS total score at baseline and outcome variables. However, TAS total scores after treatment correlated positively with Eating Disorder Inventory (EDI) scores, and negatively with a specific prognostic score; indeed, patients with persistent alexithymia were characterized by a higher number of ED symptoms and a less favorable prognosis. In a subsequent open-label study of 25 patients (24 females, one male) with bulimic symptoms (BN, AN-B/P, EDNOS, and BED), Shiina et al14 examined predictors of drop-outs from treatment programs; subjects underwent an outpatient 10-week group therapy, combining CBT with assertiveness training and self-esteem reinforcement therapy (CBT combined group). Thirty-six percent of participants failed to complete the program, but alexithymia was not predictive of drop-out. Speranza et al15 investigated the prognostic value of alexithymia in a sample of ED patients in the context of a 3-year prospective, naturalistic follow-up study. This study represents the first longitudinal project to investigate the predictive value of alexithymia respect to long-term clinical outcome of patients with ED. The sample consisted of 102 young women, with an average or high level of education and a severe, chronic ED, including 63 AN and 39 BN patients, diagnosed according to DSM-IV criteria. The study featured a naturalistic design, with therapeutic interventions being freely chosen in line with routine clinical practice. Patients with a comorbid major depressive episode or alcohol or drug addiction were excluded in order to obtain a more homogeneous sample, by excluding confounding factors. Clinical outcome at 3 years was defined both in terms of categorical diagnosis (presence or absence of criteria for diagnosis of ED) and in terms of clinical improvement between baseline and follow-up. Based on the presence of ED symptoms, two categories of outcome were defined: favorable, characterized by a complete disappearance of ED symptoms at follow-up, and intermediate/unfavorable, characterized by persistence of a subsyndromic condition or full ED syndrome. Overall, a negative outcome emerged, with 75% of patients featuring an intermediate/unfavorable outcome, and only 25% a favorable outcome. The majority of patients underwent at least one type of therapeutic intervention over the 3-year period, mostly psychotherapy (57%), followed by the prescription of drugs, generally antidepressants (40%). DIF dimension of TAS-20 revealed to be a significant predictor of unfavorable outcome, being negatively correlated to clinical improvement. The predictive power of TAS-DIF dimension alone emerged as significant, albeit to a lower degree, in a second predictive model that took into account the impact of depressive symptomatology (evaluated by means of BDI), clinical severity (evaluated through CGI), and treatments received. Indeed, patients showing more difficulty identifying emotions at baseline were found to be more often symptomatic at follow-up, with a less favorable clinical course. Leweke et al16 studied 28 patients with ED, diagnosed according to International Classification of Diseases, 10th revision (ICD-10) criteria, in the context of a large study of 480 patients affected by a series of different diagnostic conditions (ED, depressive disorder, anxiety disorder, acute or post-traumatic stress disorder, and somatoform disorder) who underwent multimodal psychodynamic intervention on an inpatient basis. In particular, treatment program included both individual and group psychodynamically oriented therapy, art and music therapy, and pharmacological treatment, if indicated. Duration of treatments ranged from 4 weeks to 8–12 weeks. A high basal level of alexithymia evaluated by means of TAS-26 was in general a significant predictor of treatment outcome, but considering each single diagnostic group, significance was maintained only for patients with somatoform disorder, with the strongest predictive power found for the DDF dimension: patients obtaining higher scores displayed a less favorable course and outcome of the disorder. Balestrieri et al18 analyzed determinants of success of short-term (10 weeks) group psychoeducation delivered on an outpatient basis to 98 patients (91% women) with BED (n=54) and EDNOS (n=44), according to DSM-IV criteria. The probability of being in recovery at the endpoint was higher for subjects with low alexithymia scores at baseline TAS-20. The study by Ohmann et al19 examined the emotional assets of 29 adolescent girls with AN who underwent a 10-month group CBT, carried out on an outpatient basis. On request, individual CBT intervention was offered. Evaluations were performed at baseline, during treatment (at 3, 6, and 9 months), 1 year after the start of the study, and 1 year after the end of treatment. Patients were divided into three groups on the basis of outcome: good (n=16), poor (n=5), and drop-outs (n=8). At all time points, slightly lower scores on the TAS were detected in the good outcome compared to the poor outcome and the drop-out group, with a tendency toward lower alexithymia scores in successfully treated patients. The drop-out patients were those with the highest baseline TAS-26 scores. The study by Beales and Dolton12 evaluated 79 women affected by chronic, severe ED treated with an array of therapeutic approaches. Patients were recruited by means of a letter sent to 200 members of the Eating Disorders Association who were invited to take part in the study. Those who joined the study were divided into three groups (anorexic, bulimic, and recovered) on the basis of EDI -2 scores. Based on total score obtained at TAS-20, 65% of patients affected by anorexia, 83% of those affected by nervous bulimia, and 33% of recovered ED patients were found to be alexithymic, with a significant difference between those who were still symptomatic and those who were recovered. In line with these results, the authors speculate that lower levels or absence of alexithymia may favor recovery of patients with ED. However, the study was not designed to determine whether recovered subjects were alexithymic or not before treatment or to detect any changes in alexithymia levels following treatment of ED. The study of Tchanturia et al17 was based on the assumption that social anhedonia (a reduced sense of pleasure from social stimulation and reduced interest to look for social interaction) may represent an important symptom dimension in ED. The study evaluated levels of social anhedonia and its correlation with alexithymia in ED patients, both symptomatic and recovered, compared to healthy controls. Of 148 subjects recruited, 91 were affected by an ED diagnosed according to DSM-IV. Participants were divided into four groups: outpatient and hospitalized AN patients (n=72), outpatient BN patients (n=19), AN patients who were recovered (n=14), and healthy controls with no family or personal history of mental illness (n=43). Symptomatic ED patients showed higher levels of both social anhedonia and alexithymia compared to recovered subjects, who showed an intermediate level of TAS total score, and to healthy controls, who displayed the lowest levels of alexithymia at TAS-20. Higher levels of social anhedonia correlated both with higher severity of ED symptoms and higher levels of alexithymia, even after controlling for severity of depression. 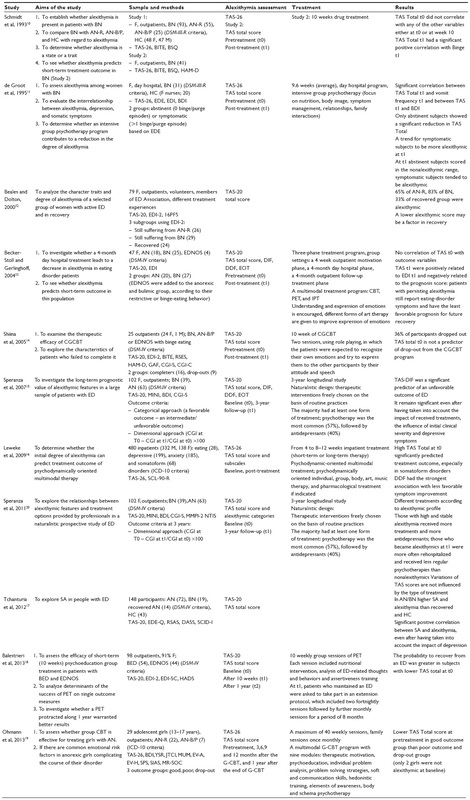 The only study to investigate the role of alexithymia as a predictor of treatment choice for ED patients was published by Speranza et al.20 The authors analyzed the relationship between alexithymic characteristics and treatment options for ED adopted by clinicians as part of a prospective, 3-year naturalistic follow-up study of a sample of 102 patients with a diagnosis of ED. Indeed, the results of the study demonstrated that patients received different treatments, both qualitatively and quantitatively, in relation to their alexithymia profile. Patients with high and stable levels of alexithymia were characterized by a tendency to receive, on the whole, the most treatments of any kind and, significantly, more antidepressants than nonalexithymic patients, despite similar levels of depression at the time of inclusion in the study. Patients who were not alexithymic at baseline but developed alexithymic traits during the follow-up period were more often hospitalized and received psychotherapy less regularly than constantly nonalexithymic subjects. Changes over time in scores obtained at TAS-20 were not influenced by the use of antidepressants, psychotherapy or by their association. Ten out of 15 selected studies examined the effects of specific treatments for ED on alexithymia levels.10,11,13,14,18,19,21–24 All studies were based on a longitudinal design; two studies provided for two treatment arms,21,24 one study compared the efficacy of an experimental intervention with routine treatments,24 and two studies included a control group of healthy subjects.10,11 The methodology adopted by each study and the treatment protocols used are shown in Table 2. Almost all studies included samples exclusively or predominantly made up of female patients. The diagnostic groups considered in these studies generally consisted of both mixed groups of AN, BN, and EDNOS,13,14,23,24 although some studies focused solely on patients with bulimia,10,11 BED,21,22 AN,19 or with BED and EDNOS.18 The duration of treatment varied from a minimum of 9.6 weeks11 to a maximum of 40 weeks,19 with a wide variability between studies. Similarly, treatment protocols displayed a high variability. With regard to treatments, only one of the studies considered included a pharmacological approach.10 In all other cases, studies were based on routine group psychotherapy, with individual therapy eventually being associated with other psychological and/or pharmacological treatments; the latter were delivered on a day hospital or inpatient basis. Other studies included only outpatients. Psychotherapeutic approaches varied considerably from one study to another (CBT, psychodynamically oriented therapy, IPT, and PET), and were frequently interassociated. In some cases, the treatment protocol included specific sessions or interventions aimed at improving the recognition, regulation, and/or expression of emotions.13,14,22,24 Mostly, studies evaluated the effects of treatments using only total scores obtained at TAS, with the exception of the studies conducted by Ciano et al,21 Becker-Stoll and Gerlinghoff,13 and Storch et al,24 where even TAS dimensions were taken into consideration. Alexithymia levels were invariably measured at the beginning and the end of treatment, with one or more assessments in subsequent follow-ups being provided only in a limited number of studies.19,21,22,24 In 60% of the studies examined, the authors found a significant or quasisignificant reduction of TAS total scores and/or DIF or DDF scores after treatment.11,13,14,18,21,22 However, even in cases where alexithymia levels decreased following treatment, the latter frequently remained high, a finding which gave rise to concerns as to the clinical significance of the registered change.11,13 When a statistically significant change, in clinical terms, was detected, the magnitude of differences in scores obtained prior to and following treatment was often seemingly low, as is the case in the study conducted by Balestrieri et al.18 Four studies found a trend toward a significant improvement in levels of alexithymia following treatment.10,19,23,24 Although treatments including specific intervention on emotions were seemingly associated with a greater efficacy on alexithymia, the relevant heterogeneity in methods of treatment and other considerable methodological limitations make it difficult to generalize and compare these results. The first study to analyze the impact of ED treatment on alexithymia was the abovementioned prospective, 10-week study by Schmidt et al10 of 41 patients with bulimia undergoing both psychotherapy and drug treatment (fluvoxamine). After treatment, no significant change in TAS total score was observed, although ED symptoms significantly improved. According to the authors, this suggests that alexithymia cannot be modified by merely improving the core symptoms of ED. The study by de Groot et al11 evaluated changes to alexithymia in a sample of 31 women with severe BN, compared to a control group of 20 healthy nurses. The treatment involved an intensive 9.6-week program based on group psychotherapy on an outpatient basis, with a focus on nutrition, body image, symptom management, relationships, and family interactions. After treatment, the levels of alexithymia measured by means of TAS-26 were significantly improved, in particular for the group of abstinent subjects (ie, those with no binge/purge episodes), although scores remained significantly higher in comparison to healthy controls. Before treatment, 61.3% of patients were alexithymic compared to 32.3% after treatment and 5% of controls. Becker-Stoll and Gerlinghoff13 examined the impact of a 4-month group therapy program on levels of alexithymia. The study enrolled 47 patients with ED (18 AN, 25 BN, four EDNOS). The program included an outpatient phase of motivation (4 weeks), a day hospital treatment phase (4 months) and an outpatient follow-up (4 months). Psychotherapeutic methods included CBT, PET, and IPT. During sessions of group psychotherapy, understanding and expression of emotion through different forms of art therapy was encouraged. A significant improvement of both ED symptoms and alexithymia was registered after treatment, regardless of diagnosis. The most significant improvement was observed for the DIF factor of TAS, with a lower impact, at the limits of statistical significance, on the factor Externally Oriented Thinking, particularly in the bulimic group. Despite the improvement of TAS alexithymia scores, patients prevalently continued to be considered alexithymic on a categorical basis. Clyne et al22 evaluated the efficacy of an 11-week psychoeducational group program including training on emotion regulation in 11 women with BED. At the end of treatment, not only was effectiveness of treatment on ED symptoms demonstrated, but also a significant reduction of levels of alexithymia; for the latter, a further reduction of TAS scores was found at 2–3 months follow-up. Shiina et al14 evaluated the effectiveness of a 10-week treatment program combining CBT with assertiveness training and self-esteem reinforcement therapy (CBT combined group) in a group of 25 patients with bulimic symptoms (BN, AN-B/P, EDNOS, and binge eating). During the final stages of treatment, two role play sessions in which patients were required to recognize their emotions and try to express them were added to the program, with the aim of improving alexithymia. Indeed, the program proved to be effective not only for ED, self-esteem, and social functioning, but even for alexithymia, given that TAS-20 total score showed a trend toward a statistically significant improvement from pre- to post-treatment (P=0.06). Iancu et al23 evaluated the effects of a combined intervention (group and individual psychotherapy, and pharmacological treatment) on 30 young soldiers (three males, 27 females) with ED (ten AN, 15 BN, five EDNOS, diagnosed according to DSM-IV criteria), enrolled in the Israel Defense Forces. The treatment included 6 months of weekly group therapy sessions based on a cognitive behavioral approach combined with a dynamic approach; if necessary, individual psychodynamic psychotherapy or pharmacological treatment was offered. Dietary counseling was strongly suggested, but not necessarily required. Five patients received paroxetine and four patients individual therapy as adjunctive treatments. The level of change of TAS-26 scores obtained after treatment was minimal compared to the improvement in eating symptoms. In the study by Balestrieri et al18, the authors analyzed the effectiveness of a short-term (10 weeks) outpatient psychoeducational group treatment in patients with BED and EDNOS. Each session included a nutritional intervention, analysis of thoughts and behaviors related to ED, and assertiveness training. After treatment, the patients showed a significant improvement in total TAS, although the clinical significance of this change appears to be negligible (TAS-20 total scores at t0=57±12; 55±14 at t1, P=0.035). Finally, Ohmann et al19 evaluated the effectiveness of a 10-month, multimodal group intervention based on CBT, performed on an outpatient basis; the study also included 29 adolescent girls with AN. The program was made up of nine modules (therapeutic motivation, psychoeducation, individual problem analysis, teaching of problem solving strategies, communication skills, hedonistic training, elements of awareness, body, and schema psychotherapy) and family sessions on a monthly basis. Individual CBT was offered on request. Evaluations were performed at baseline, during treatment (at 3, 6, and 9 months), 1 year after the start of treatment, and 1 year after the end of treatment. Alexithymia proved to be a psychological dimension resistant to change, while body mass index, eating behavior, mood, social anxiety, self-care, and self-efficacy showed significant improvements; however, lack of efficacy of treatments in reducing alexithymia was particularly evident among poor outcome patients. Ciano et al21 evaluated the effectiveness of two types of group therapy in eleven female patients with BED. Six patients were included on a nonrandomized basis in a group of brief psychoanalytic psychotherapy (14 sessions, 28 weeks), and five patients in a group of PET (ten sessions, 10 weeks). The main purpose of analytical group psychotherapy was to improve self-esteem and, consequently, the control of craving. According to the authors, the homogeneity of the group allowed a “high cohesion and mutual mirroring, promoting awareness of the link between emotions and behavior.” PET focused on information about nutrition, communication skills and assertiveness, and nutritional rehabilitation. The treatment provided for role playing and problem solving aimed at changing dysfunctional attitudes regarding eating. Follow-ups were carried out at 6 and 12 months. After treatment, both interventions proved to be effective on ED, but only psychoeducation was associated with an improvement of scores for DIF and DDF factors of TAS-20, during treatment and at each subsequent follow-up, with a significant reduction in scores of only DDF at 6 months follow-up. Storch et al24 examined the effects of an additional psychoeducational group training aimed at aiding recognition of bodily sensations related to emotion, and improving emotional regulation skills. Nineteen female patients with ED, 15 with AN, and four with BN diagnosed according to DSM-IV criteria were recruited to the study. Evaluations were performed at baseline and 3 and 12 months after treatment. Patients were consecutively assigned to the control group (n=11), receiving standard hospital care, or to the treatment group (n=8), receiving psychoeducation training in addition to the standard hospital care. Four hourly training sessions were delivered for three consecutive Mondays, with a booster session after 8 weeks. Only DIF and DDF subscales of TAS-26 were evaluated, being considered the dimensions with the highest involvement in ED. After treatment, DIF scores were reduced in both groups compared to baseline levels, although the differences detected were not statistically significant. At 3 and 12 months follow-up, the addition of psychoeducational training was associated with a significant improvement in the ability to regulate negative affect and with a lower food restriction compared to standard treatment. Despite the clinical relevance of alexithymia for ED, studies focusing on its therapeutical implications are still limited, being characterized by heterogeneous designs and significant methodological limitations. In the majority of cases, the samples studied are relatively small and made up of patients with different types of ED. The period of observation in many longitudinal studies is too short, with evaluations of alexithymia being carried out largely only at baseline and post-treatment. Criteria adopted to assess clinical improvement are often poor and, in many cases, outcome measures do not take into account the level of clinical change over time. Moreover, the majority of studies does not provide for control or treatment comparison groups. Although TAS is viewed as the most reliable instrument, none of the studies considered in this review include other adjunctive methods of evaluation of alexithymia, and refer to alexithymia as a unitary construct, without taking into consideration its single dimensions. In this regard, to improve the quality of future research, a multidimensional multimethod approach to evaluation of alexithymia has been strongly suggested.6 Lastly, published studies frequently fail to give due consideration to confounding factors such as depression. A pressing need to achieve a better outcome in the treatment of ED underlines the urgency of identifying reliable outcome predictors and personalized care approaches aimed at new treatment targets. Despite the limitations described previously, data currently available in literature support the relevance of a significant impact of alexithymia on outcome of ED treatment. Contemporarily, a moderate impact of ED treatments on alexithymia has also been demonstrated, with a trend for greater efficacy of treatments, including specific interventions on emotions. The fact that alexithymia levels often remain high even when symptoms improve underlines the need for treatments proving more effective on this dimension to be identified. Further research should be carried out using the most appropriate methodological options to provide further insight into the role of alexithymia in ED, focusing in particular on the choice of treatments and identifying treatment protocols better suited for use in ED patients with pronounced alexithymic traits. Wilson GT, Grilo CM, Vitousek KM. Psychological treatment of eating disorders. Am Psychol. 2007;62(3):199–216. Kass AE, Kolko RP, Wilfley DE. Psychological treatments for eating disorders. Curr Opin Psychiatry. 2013;26(6):549–555. Agras WS, Robinson AH. Forty years of progress in the treatment of the eating disorders. Nord J Psychiatry. 2008;62 Suppl 47:19–24. Bodell LP, Keel PK. 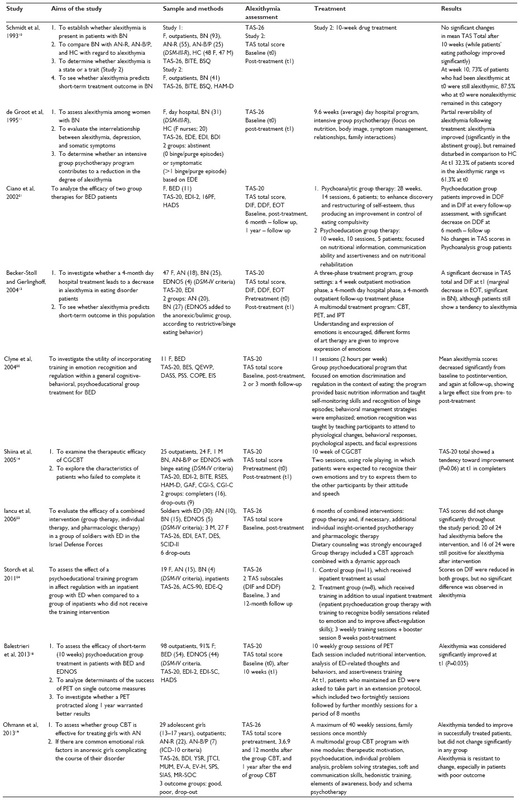 Current treatment for anorexia nervosa: efficacy, safety, and adherence. Psychol Res Behav Manag. 2010;3:91–108. Epub October 19, 2010. Sifneos PE. The prevalence of ‘alexithymic’ characteristics in psychosomatic patients. Psychother Psychosom.1973;22(2):255–62. Taylor GJ, Ryan D, Bagby RM. Toward the development of a new self-report alexithymia scale. Psychother Psychosom. 1985;44(4):191–199. Bagby RM, Parker JD, Taylor GJ. The twenty-item Toronto Alexithymia Scale – I. Item selection and cross-validation of the factor structure. J Psychosom Res. 1994;38(1):23–32. Nowakowski ME, McFarlane T, Cassin S. Alexithymia and eating disorders: a critical review of the literature. J Eat Disord. 2013;1:21. Schmidt U, Jiwany A, Treasure J. A controlled study of alexithymia in eating disorders. Compr Psychiatry. 1993;34(1):54–58. de Groot JM, Rodin G, Olmsted MP. Alexithymia, depression, and treatment outcome in bulimia nervosa. Compr Psychiatry. 1995;36(1):53–60. Beales DL, Dolton R. Eating disordered patients: personality, alexithymia, and implications for primary care. Br J Gen Pract. 2000;50(450):21–26. Becker-Stoll F, Gerlinghoff M. The impact of a four-month day treatment programme on alexithymia in eating disorders. Eur Eating Disord Rev. 2004;12(3):159–163. Shiina A, Nakazato M, Mitsumori M, et al. An open trial of outpatient group therapy for bulimic disorders: combination program of cognitive behavioral therapy with assertive training and self-esteem enhancement. Psychiatry Clin Neurosci. 2005;59(6):690–696. Leweke F, Bausch S, Leichsenring F, Walter B, Stingl M. Alexithymia as a predictor of outcome of psychodynamically oriented inpatient treatment. Psychother Res. 2009;19(3):323–331. Tchanturia K, Davies H, Harrison A, Fox JR, Treasure J, Schmidt U. Altered social hedonic processing in eating disorders. Int J Eat Disord. 2012;45(8):962–969. Balestrieri M, Isola M, Baiano M, Ciano R. Psychoeducation in Binge Eating Disorder and EDNOS: a pilot study on the efficacy of a 10-week and a 1-year continuation treatment. Eat Weight Disord. 2013;18(1):45–51. Ohmann S, Popow C, Wurzer M, Karwautz A, Sackl-Pammer P, Schuch B. Emotional aspects of anorexia nervosa: results of prospective naturalistic cognitive behavioral group therapy. Neuropsychiatr. 2013;27(3):119–128. Speranza M, Loas G, Guilbaud O, Corcos M. Are treatment options related to alexithymia in eating disorders? Results from a three-year naturalistic longitudinal study. Biomed Pharmacother. 2011;65(8):585–589. Ciano R, Rocco PL, Angarano A, Biasin E, Balestrieri M. Group-analytic and psychoeducational therapies for binge-eating disorder: an exploratory study of efficacy and persistence of effects. Psychother Res. 2002;12(2):231–239. Clyne C, Latner JD, Gleaves DH, Blampied NM. Treatment of emotional dysregulation in full syndrome and subthreshold binge eating disorder. Eat Disord. 2010;18(5):408–424. Iancu I, Cohen E, Yehuda YB, Kotler M. Treatment of eating disorders improves eating symptoms but not alexithymia and dissociation proneness. Compr Psychiatry. 2006;47(3):189–193. Storch M, Keller F, Weber J, Spindler A, Milos G. Psychoeducation in affect regulation for patients with eating disorders: a randomized controlled feasibility study. Am J Psychother. 2011;65(1):81–93. Cameron K, Ogrodniczuk J, Hadjipavlou G. Changes in alexithymia following psychological intervention: a review. Harv Rev Psychiatry. 2014;22(3):162–178. Eizaguirre AE, de Cabezon AOS, de Alda IO, Olariaga LJ, Juaniz M. Alexithymia and its relationships with anxiety and depression in eating disorders. Pers Indiv Differ. 2004;36:321–331. Sexton MC, Sunday SR, Hurt S, Halmi KA. The relationship between alexithymia, depression, and axis II psychopathology in eating disorder inpatients. Int J Eat Disord. 1998;23(3):277–286. Ogrodniczuk JS, Piper WE, Joyce AS. Effect of alexithymia on the process and outcome of psychotherapy: a programmatic review. Psychiatry Res. 2011;190(1):43–48.